Author Notes: Just enough sweetness to tow the line between a condiment for roasted and grilled meats and a treat to slather on toasted baguette, this is a great way to preserve summer’s bounty. Merrill and I are huge fans of tomato preserves, but I’d never made one quite like this. Jennifer Perillo’s recipe calls for vinegar, cumin, coriander, onion and salt, which I expected to translate into a chutney-like preserve. But there’s enough sugar in this jam to keep it balanced — deliciously — between a sweet and savory. 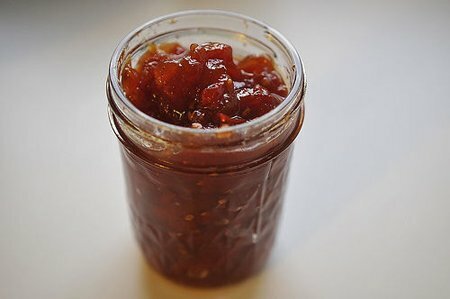 It made me realize that tomatoes really need an acid like vinegar to underline their sweetness; the vinegar also adds an important feeling of richness to the jam. Jennifer Perillo says you can serve the jam with grilled meats as well as spread it on toast. The only issue with this recipe is that it makes just 3 half pints; I’d like to share it and yet I’d find it difficult to part with any of them.